Numerology is the study of how the numbers affect people's daily lives. Each number has a unique vibration and the combination of numbers in a person's chart has a huge influence on their personality and life trends. Numerology is an ancient study dating back thousands of years and was used by a wide variety of cultures to assist in a variety of endeavours. Numerology can be used to help people gain enhanced self understanding in addition to predicting the future energies and trends in their lives. Each number has a different vibration and energy to it. If you were born on a double digit number, two or three numbers will influence you but the most important is the single digit number your birthday breaks down to. For example if you were born on the 15th, 1, 5 and 6 will influence you but 6 is most important. A note about master numbers: In numerology, numbers 11 and 22 are master numbers. They have a higher vibration than the first nine numbers and contain elevated energy. They are special because people who are able to tune into these extraordinary inspirational and illuminating energies have a significant advantage in becoming successful at their pursuits which are usually unconventional and more challenging than most. However, ultimately 11 and 22 break down into the numbers 2 and 4 respectively and if a person is not capable of or willing to work with the higher energy, their characteristics and purpose will more closely align with the single digit number. In other words, significant effort and dedication on the part of a person to use this special energy is critical to maximizing their vast potential. When a person has two or more master numbers in their five core numbers and expends significant effort towards their purpose, the results can truly be astounding. In numerology, there are 5 core numbers that are integral to shaping character. The more times a number repeats in your core numbers, the more strongly you will resemble that number. These numbers are derived from a person's birthday and their full name at birth. Each letter of the alphabet corresponds to a number. If Y is between two consonants it is counted as a vowel. If Y is beside one or two vowels it is counted as a consonant. These letters are important in calculating the soul urge, personality and expression numbers. The Life path number tells us about a person's natural gifts and skills and what course of action you need to take in this life to be happy. This number is reflective of our purpose in life, by acting in accordance with it life flows a lot more easily and with a lot less stress. It is calculated by adding the month, day and year of birth. January is 1, February is 2, March is 3...etc up to December being 12. For example, if you were born August 14th 1958, you add 8 (August) + 14 + 1+9+5+8= 45= 9. The Birthday number tells us about a person's personality traits, their talents, what they value or think is important in life, their motivation, and their goals. There is no calculation involved, it is simply the date we were born. The soul urge number is a very personal number and its energy is not always obvious to anyone other than the person themself. It is a person's secret wishes and desires; we need to fulfill the needs of this number in order to feel comfortable and secure. If the needs of the soul urge number are not met, there is a sense of dissatisfaction, even if on the surface everything in our life seems to be going well. The soul urge number is calculated from the vowels in a person's name. a= 1 + e= 5 + a=1 + i=9 + a=1 + o=6+ i=9 +e=5= 37= 1. Karen's soul urge number is 1. The personality number describes the impression we make on people when we first meet them. It influences our personal style and dress, our mannerisms, and our outward demeanour. These are our most public characteristics. These characteristics are not necessarily reflective of what we wish to convey to others because they naturally manifest without our conscious knowledge. The personality number is calculated by adding the consonants in a person's name. k=2+ r=9+ n=5 +m=4 + r=9 +j=1 +l=3 +n=5 +g=7 +r= 9 = 54= 9. Karen's personality number is 9. The expression number reveals important and deeper characteristics of a person. This is a number whose energies we are consciously aware of and when told of these characteristics we immediately identify with them. The expression number is similar to the life path number in that it is important in showing us our purpose, the goals and activities we should prioritize in order to evolve the most in this life. The expression number is calculated by adding all the letters in a person's name. Note that the personality number plus the soul urge number should add to the expression number, if it doesn't you have made a mistake in the calculations. 2+ 1+ 9 +5+5+4+1+9+9+1+1+6+3+9+5+7+5+9= 91. Karen's expression number is 1. Intensity Number: The intensity number adds another perspective of analysis to a person. Just as the name implies, this number pushes its expression into the outer world with power, it is a part of a person that they naturally and strongly express without thinking about it. It is calculated by giving each letter in your full birth name a number using the same conversion as the soul urge, personality and expression numbers. Then, you add up how many times each number shows in your name, the number that appears most frequently is the intensity number. Since nine appears most frequently, Karen's intensity number is nine. If you have two numbers that appear most frequently, both numbers are your intensity number. If you have a tie between three or more numbers that appear most frequently, you do not have an intensity number. Number of lack: The number of lack represents the qualities and characteristics that do not come easily or naturally to us. We have to consciously integrate the qualities of this number into our lives. It is not an unfortunate or unlucky number, it is simply a challenge to develop this number's potential. It is calculated in the same way as the intensity number, except we are now looking for the number(s) that do not appear. From the example above, Karen has no number 8s in her name, therefore her number of lack is 8. Note that, if your number(s) of lack appear in one of your core numbers, you will not have to face the challenge of developing the qualities of the missing number since the qualities are already prominent in you. The first letter in your first name: This letter's corresponding number energy is an additional insight into the natural way of being for a person, they are usually observable after getting to know them for a while. For example, if your name starts with A, S, or J you are likely to be independent and competitive. If your name starts with B, K or T, you will likely be more gentle and a good listener. The essence number for a year reveals the ruling energy for the period and as a result, the probable opportunities and types of events and people we will attract into our lives. The older you are, the longer this calculation will take as you must start from the year of your birth. 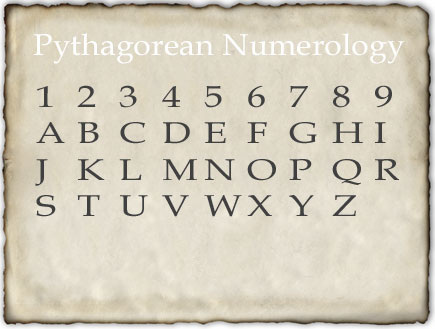 You must write your first name, middle name(s) and last name and repeat each number according to its conversion in the Pythagorean number system. When you run out of the repeating letters in the first, middle or last names, simply start the process over for that name. If your essence for a year equals a master number (11 or 22), you have access to those special elevated vibrations for that period even if you do not have either master number in your core numbers. However, you must expend significant effort to effectively use those higher energies, otherwise the energy defaults to 2 or 4 respectively. Important trends to look for are numbers that repeat 4 or more times in a row. These periods of time will be very memorable and significant for the integration of that number's characteristics and energies into a person's life, it is a turning point. For example from the ages of 12-19, Karen had seven 5s in a row. During this period, she could have travelled extensively, met a lot of new people, had a great diversity of new experiences, been very restless, moved homes many times and had many projects going on simultaneously.These experiences would have had a tremendous effect on her character and she will forever be changed by them. There are several ways you can use the power of numerology to maximize success in your life. You can never change your birth name but you can change your name legally later in life either by marriage, using a "stage name" or by registering a new name with the appropriate authorities. When you change your name for any reason, you are modifying the numbers' energy in your life. You will never be able to completely eliminate the energy of your original birth name but by changing it, the new name's energy becomes more dominant. Choosing a baby's name is extremely important because you are helping to shape a major part of their character and life purpose. You might also take into consideration that certain numbers get along best with each other (1,5 and 7) (2,4, and 8) and (3,6 and 9). You should aim for at least 2/5 numbers being in best compatibility with each parent for more harmonious relations. Numerology is helpful in choosing a house address and city/country to live. You will want to choose an address that is harmonious with your core numbers and/or gives the energies you most desire in your personal atmosphere. For example, if you want a relatively peaceful, stable domestic life with children, you will want your address to add to 6. If on the other hand you want a busy house with lots of friends, social activities, diverse people and changes you will want your address to add to a 5. In choosing a city and country to live, keep in mind that each place has a vibration and you can figure out the 'personality' of a place by calculating its number. For example, Canada is number 6. This makes sense considering on a worldwide level, Canada is known as peace-loving, financially stable and polite. The 1st, 10th, 19th and 28th of the month are good days for initiating new projects, being assertive and taking calculated risks. You should think and/ or act independently and originally for best results. You might want to play a competitive sport or be otherwise physically active (hiking, dancing, running, biking etc) to expend your physical energy. The 2nd, 11th, 20th and 29th of the month are good days for relationships of all kinds. You should spend time on these days listening to other people's views and feelings, you are better able to understand them now. If you were in a fight with someone, these are great days to try to makeup with them because diplomacy is heightened. Social activities of all types are favoured, try to spend quality time with a person or group of people you cherish. The 11th of the month specifically is good for reading books on spirituality or philosophy, meditating, attending a lecture on spiritual/ inspirational topics or discussing the deeper questions of life. The 3rd, 12th, 21st and 30th of the month are good days for pleasurable activities and having fun. Play games, go to the theatre, movies, to a restaurant, arcade, club or somewhere else that makes you happy. Spend time with people who make you laugh today, it is not a day to get bogged down in deep talk or heavy emotions. Express yourself creatively through your favourite hobbies or passions, for example, singing, dancing, drama, writing, composing music or anything else that you love to do. something that is out of your comfort zone and possibly foreign to you. Short distance trips will work out better on these days. If you need to take a risk or gamble, it stands more of a fighting chance of working out on a 5 day. Read a book that transports you to a new world where you can learn about different people, cultures and ways of living. Do not engage in activities that require focused concentration and attention to detail; the energies today are scattered and restless. These are great days for having large parties or functions. than being tied down to old ways of thinking or doing things. The 7th, 16th and 25th of the month are good days to spend alone reading, researching, studying, meditating and spending time near water or in nature. These days favour critical analysis on world issues, academic subjects or books of interest. Discussions on the deeper questions in life will generate fruitful discussion. The 8th, 17th and 26th of the month are good days for all types of business, financial and career matters. You should research investments and make concrete goals for making or saving money. If you are thinking about starting a business, these days are good for formulating an effective business plan. Write down your career goals and the steps you will take to achieve them. Pay extra attention to your driving as you are more likely to get into an accident or receive a ticket on these days (especially if your life path is 8 or you have repeating 8s in your core numbers). The 9th, 18th and 27th of the month are good days for finishing up projects or wrapping up matters that you have been dealing with to date, do not start a new project. Humanitarian efforts and volunteering are favoured; try to be generous with your money and time. Give away things that you do not really need anymore, there will be someone who very much appreciates it. Try to let go of old memories from the past that cause you to feel anger and resentment, the energies on these days will help you to permanently let go and forgive someone if you strongly desire to.